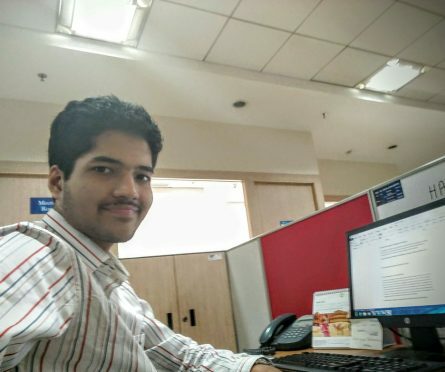 About the Author: Suyash Thakare, a student of Sardar Patel Institute of Technology, recounts how he got the UX design internship at Reliance Industries Limited (RIL) and how the internship experience further helped him in his career. I applied for the position of “UI/UX Design Intern” at Reliance Industries Limited through Internshala. I heard back from one of the HR personnel about four to five days later (which was pretty prompt for a company that huge). She asked me to tell her about myself and if I could come over to their office at Ghansoli, Mumbai for an interview. I said yes and confirmed the meeting. (Why would I say no? It was Reliance for heaven’s sake!) My heart was already jumping with anxiety and excitement. I went to their office a couple of days later. The interviewer asked me about my previous internships (I had done two relevant internships before) and the nature of the projects that I had worked on. I was asked to walk her through the thought process that I had adopted for my designs. She asked me several UX questions related to the designs, what UX tools I had used till date, and then some regarding my UX notes (Yes, I had carried them along. It might sound counterintuitive but I did so to show what kind of knowledge I had gained in my UX certifications). The interview lasted for about half an hour. I was told I would be having a phone interview call soon from the team that I would be working with. I received the call a couple of days later. It lasted for 5-10 minutes. They wanted to know about my availability for the internship. One day later, I received the offer. My happiness knew no bounds. I had dared to choose a different career path from most of my classmates, and it wasn’t turning out to be bad at all. I would like to divide my experience at RIL into two halves since I worked for two different teams. I was tasked with redesigning the employee self-service portal (It’s for HR related functions of an employee). Though I had a manager and several other employees to help me out in one way or another, there wasn’t a single employee of the UX domain on that team. (Yes, you can say I was lonely!) To make things worse, I was supposed to make contributions like an employee. (An internship is supposed to be a learning experience too, right? I felt gloomy at times, but things eventually improved). A UX consultant from another team was the person I used to collaborate with for the project. He turned out to be a mentor, a friend, and everything in between. During an internship, if you get a good mentor, consider yourself lucky. You’ll learn things you’ve never thought you would. It’ll be an enlightening experience. Since the portal was the only project that I was allowed to work on, at times I had nothing to do (People, apart from me, had other projects to work on too). That’s when I decided I needed to switch teams. And I did exactly that, a month later. You can find my work on this project here. I was going to work on two first-of-their-kind projects in India, and that fact made me even more enthusiastic; I was raring to go. I was given a lot of work independence too. And boy, if you ask me how the experience was, I am going to say only one thing – it was unparalleled. As they say, a single meaningful internship will teach you things that you’ll probably never learn in four years of engineering. I learned to deal with people in a much better way. I networked with employees and learned a plethora of things. Internships aren’t only about learning and contributing with respect to your domain; they are also about networking and people and much more. They’re about stories that you’ll get to know and the memories that you’ll create. Those will stick with you and metamorphose you as a person, for good. You can find my work on these two projects here and here. In a nutshell, if you ask me, things have definitely changed. That’s the power of a single meaningful internship. And, I’ve Internshala and Reliance to thank for this life changing experience. Editor’s note: Inspired by Suyash’s experience? Apply to these cool UI/UX internships and take another step towards your dream career.